It’s the first thing a journalism student hears upon acceptance into J-school: don’t plagiarize. It’s beaten into our heads from the moment we walk through the door, and its consequences effectively branded upon our minds for semesters to come. Yet, this doesn’t seem to stop some of the less ethically-bound among us from lifting as little as a sentence fragment to a staggering four paragraphs (details to come) as a substitute for originality and authenticity. Upon discovery, its consequences extend far beyond a blemish on the plagiarist’s academic and/or professional record. As John E. McIntyre, copy desk chief for The Baltimore Sun suggests, “a shadow will linger” over the institutions that publish the offending material. As a journalist’s sole responsibility is to present an honest, original and unbiased representation of news developments (though an alarmingly large sector of the modern media seem to have forgotten or have wilfully ignored the latter), anything resembling credibility is instantly forfeit when plagiarism is committed. And noting more than a few ways of fact-checking/confirming legitimacy in the online era, plagiarism is more than a question of morality – it’s a question of intellect. 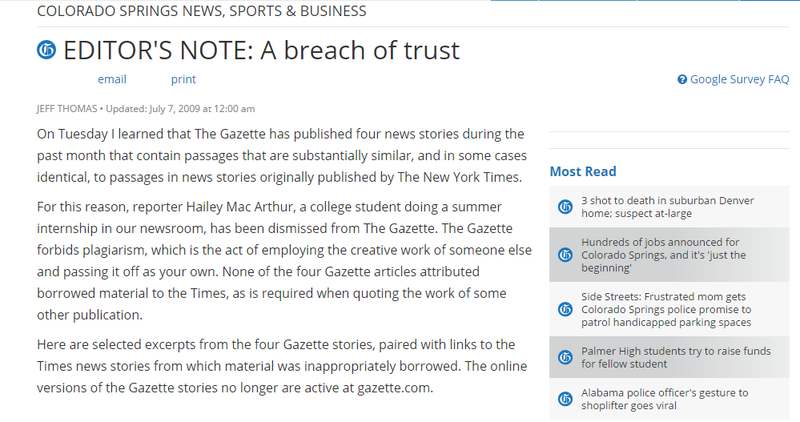 Notable in student history is the case of University of Florida student Hailey Mac Arthur’s internship at Colorado’s The Gazette in the July of 2009. For reasons seemingly unbeknownst to her peers or employers at the time, Mac Arthur was found to have been guilty of knowingly copying and pasting as many as four paragraphs from articles posted on the website of the prolific New York Times. Mac Arthur was effectively fired, the stories were pulled, and an apology was issued by Editor Jeff Thomas on behalf of the paper. That Mac Arthur thought it suitable not only to lift the source material without attribution (not that attribution would’ve excused the disconcerting lack of originality), but to take it from one of the most recognized publications in the western hemisphere lends credence to the assertion that plagiarism is not just the hallmark of the dishonest, but the hallmark of the stupid as well. The monumental level of coverage that the scandal received for months to come illustrates just how great of an infidelity to journalistic integrity – and in fact, to the public to which we speak as a whole – plagiarism and distortion are. When your indicated job is to report the news as it happens, there is no greater failure imaginable than to publish stolen or falsified material. It represents a breach of professional conduct, as well as an unforgivable misapprehension with regards to what a journalist is supposed to be. It is rarely just an “honest mistake”. It is a deliberate act of theft and fraudulence. Blair’s trend of adding succinct details to his falsified coverage represents how often the purveyors of journalistic dishonesty put a surprising amount of work into taking the perceived “easy road”. Just like the common liar, the guilty are often forced to compound their falsehoods when questioned – each lie covering up for the void left by the last, until the story can sustain itself no more. In truth, the plagiarist shares more with the common liar than one might expect. Like a liar, their actions – while detrimental to their peers and all those who trust them – often end up damaging their own lives far beyond the reputations of their benefactors. The New York Times and The Gazette will rebuild. Jayson Blair and Hailey Mac Arthur will not. Anything so much as a Google search yields as many as hundreds of thousands of pages chronicling their humiliations at length, each with a fellow journalist chiming in with an opinion of their own on how spectacularly they have failed. The plagiarist is forever tainted, and is deemed eternally useless in any field for which literary honesty is a prerequisite. The cost of plagiarism is higher than most would care to acknowledge, and it comes with the added price of perverting the very foundations upon which journalism stands. It is a blight on news media, and one which is to be confronted and disciplined at every available opportunity.